Chojuro leads Boruto and Sarada to the location where Shizuma and his "New Seven Shinobi Swordsmen" are based. Shizuma uses his jutsu to create a fog that clouds the trio's vision, and they end up getting separated. Sarada is forced into one-on-one combat with a kunoichi, Buntan Kurosuki, who wields the Lightning Blade, Kiba the Fang! 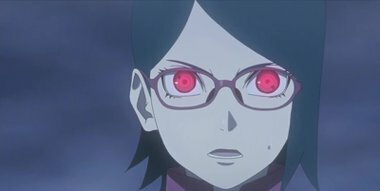 In the thick fog, Sarada uses her Sharingan, but her enemy is stronger than expected. Driven into a corner, she comes up with a counterattack. Meanwhile, Boruto goes up against none other than Kagura.